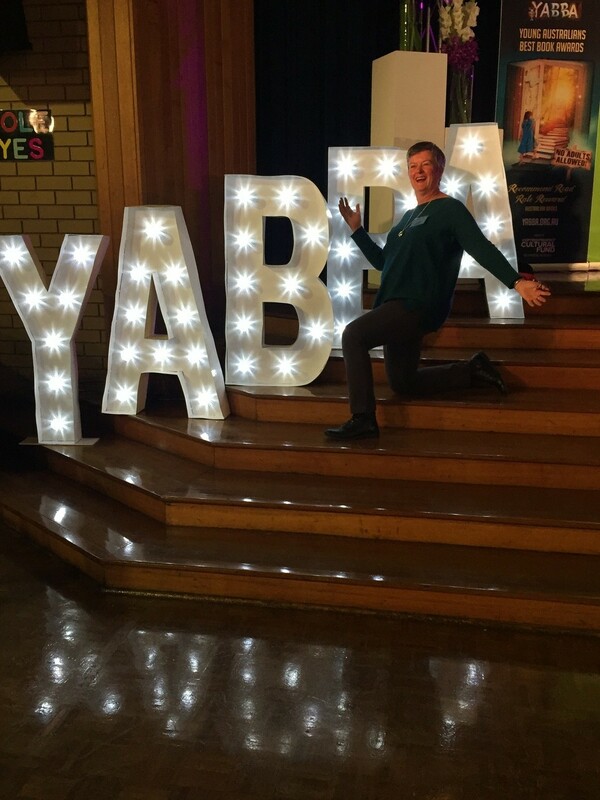 Yesterday was the thirtieth YABBA Awards ceremony, this year held at Sacre Coeur in Glen Iris. (follow the link for the winners). These children’s choice awards are always fun. 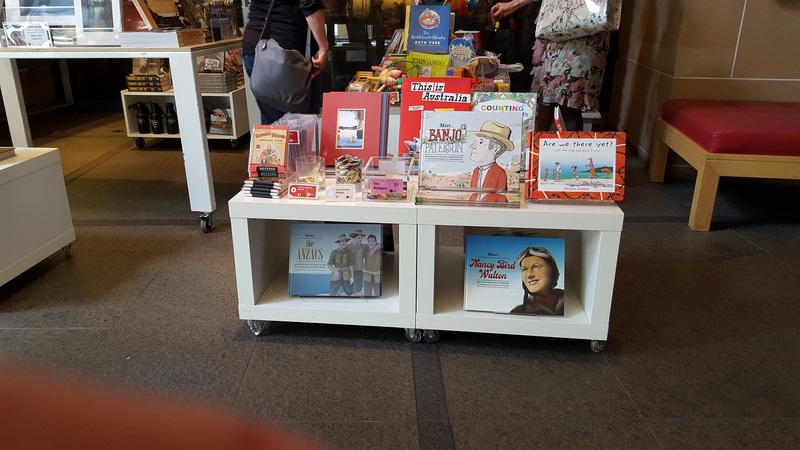 Students are bussed in from schools all around the place and authors and illustrators (whether or not their books are in consideration) are feted. After the awards, there’s morning tea, then a chance for students to gather signatures and talk to authors and illustrators, before lunch. We were escorted by Sacre Coeur students to and from the hall and there was plenty of time to chat with them and other students in between signings. 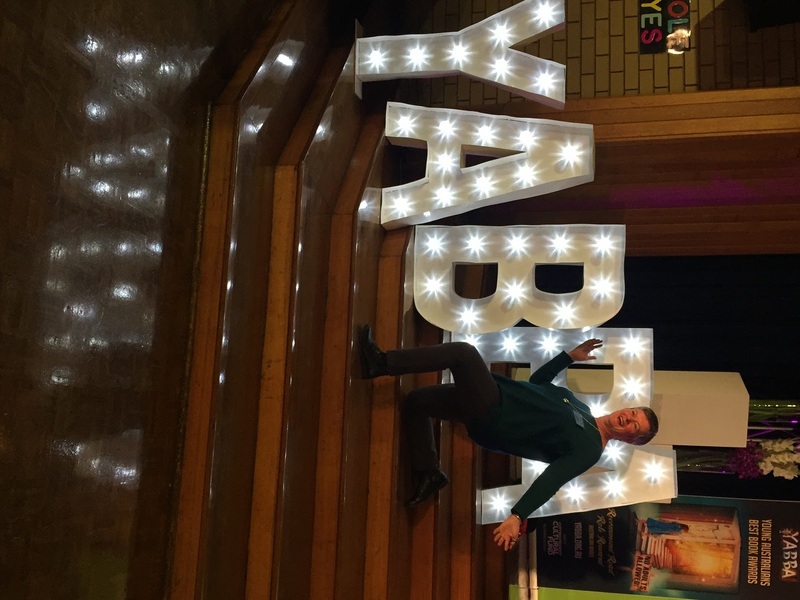 This year’s event was particularly glitzy as you can see. Brought out the Hollywood in me. Lucky we had to leave the hall for lunch. Otherwise, I may have had to sing. At the end of the story, we ‘fly away home’. Rach had made ‘seagulls and hung them from a tree (flap, flap, twirl). You can see one in the top right of this pic. 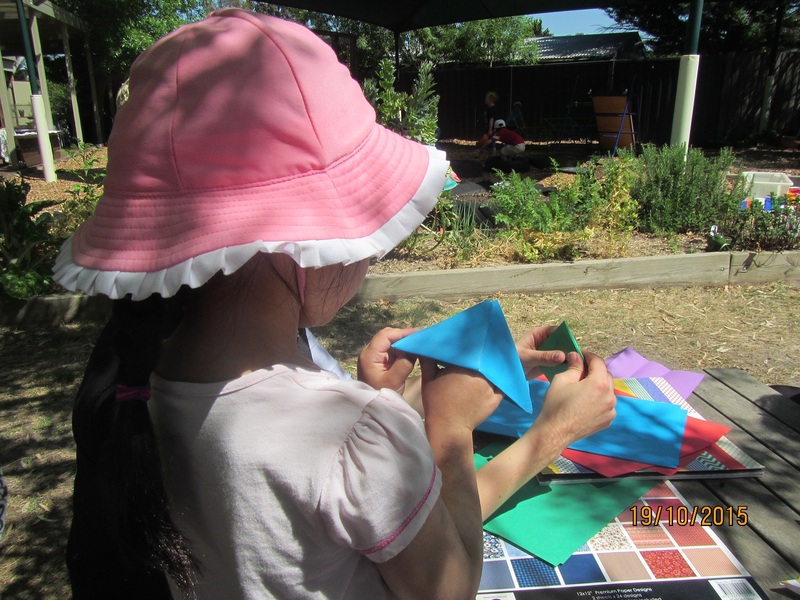 The children had been fascinated by their construction but they found them a little complicated to make themselves, so I offered to show them how to make two simpler types of boats. This girl sat by me and followed my movements as I made a boat. When we were done, she wanted to make another one so she followed me again. Then she made a third. Then, she instructed another girl in making her own! Amazing. 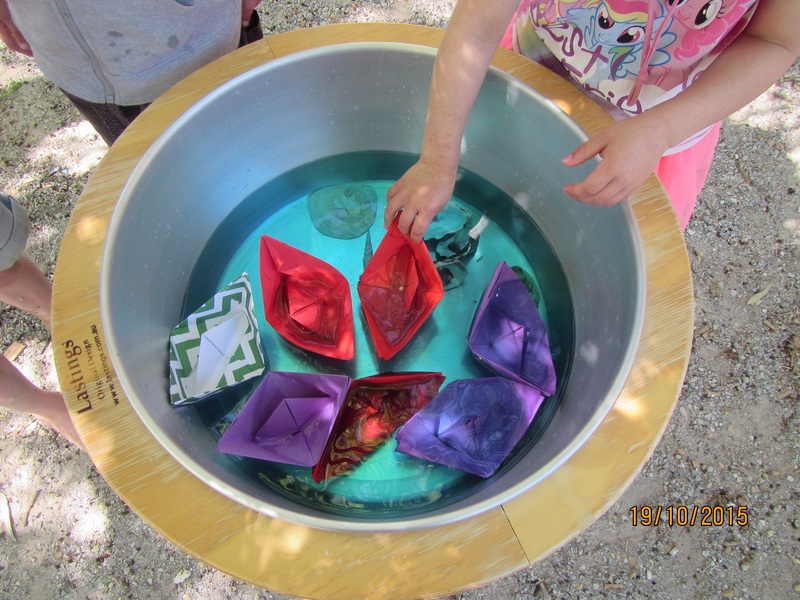 We made many boats, in many colours and two different styles. Some worked best sitting on the table. Others needed to be sailed. 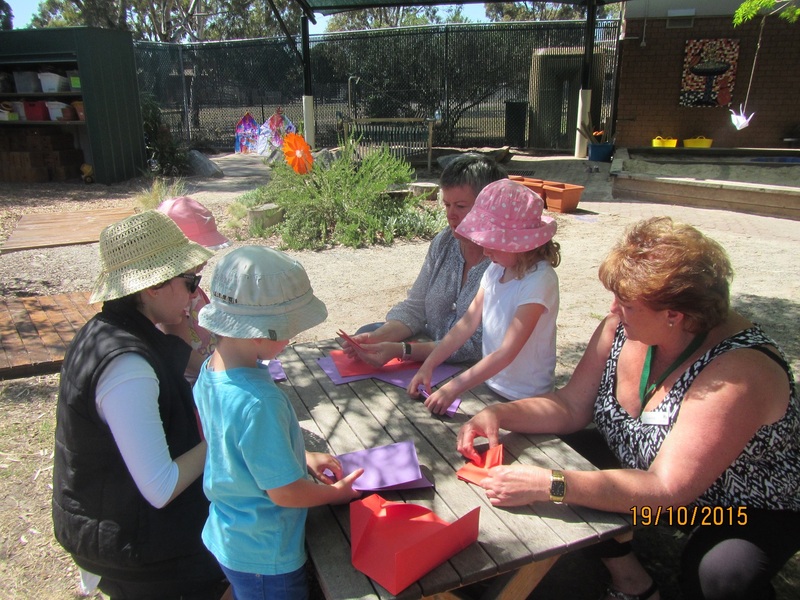 Two wonderful mornings with inspiring and aspiring teachers, engaged and enthusiastic children in an environment rich in stimulus and opportunity for child-led learning. Thanks to Rach and Louise for letting me be part of it. Sydney turned on brilliant weather for our half work/half play weekend. 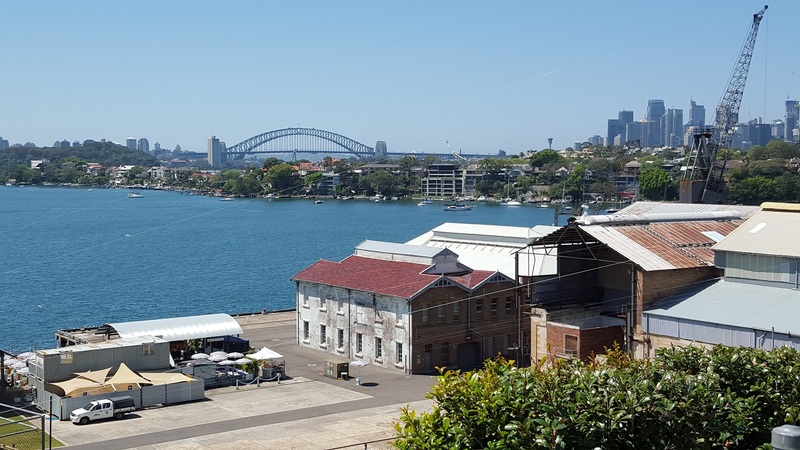 We arrived early Friday and caught a ferry to Cockatoo Island. Why? Why not? Neither of us had been there and knew little about it. 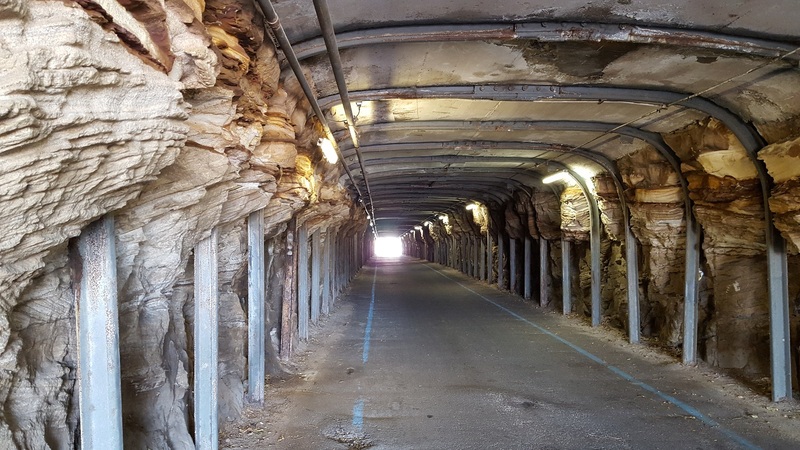 There were convicts there (well … not when we visited, but in earlier times) and they had to hew the sandstone blocks to build their shelters. 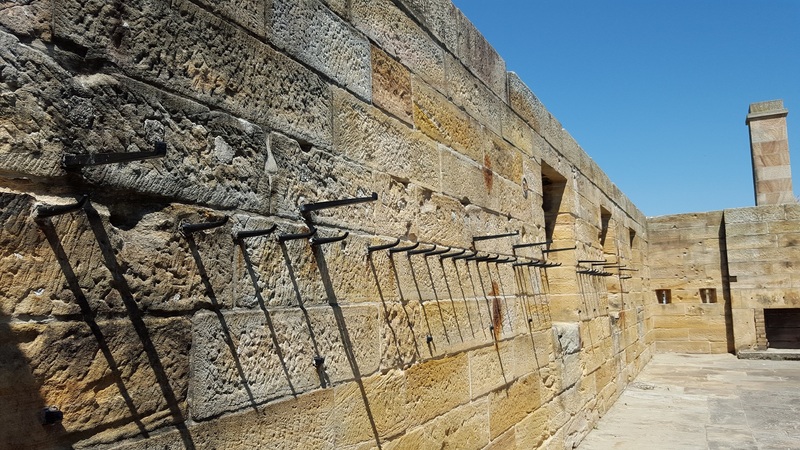 This was a barracks, and if the hooks reflect the number of guards, it was a busy place. This fireplace in the kitchen is gone, but the skeleton remains, looking something like a cross between an octopus and tree roots. It was seagull nesting time and they were nesting everywhere. They sit in shallow ground nests and not always out of sight. 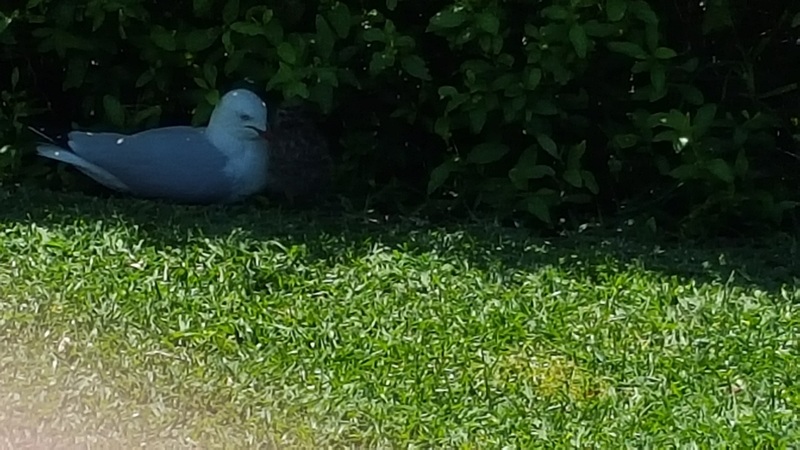 This gull has a newly hatched chick. They are stripey, a bit like emu chicks. The gulls are very protective and become very vocal if they think you are too close. Very. This is the view from the top of the island. 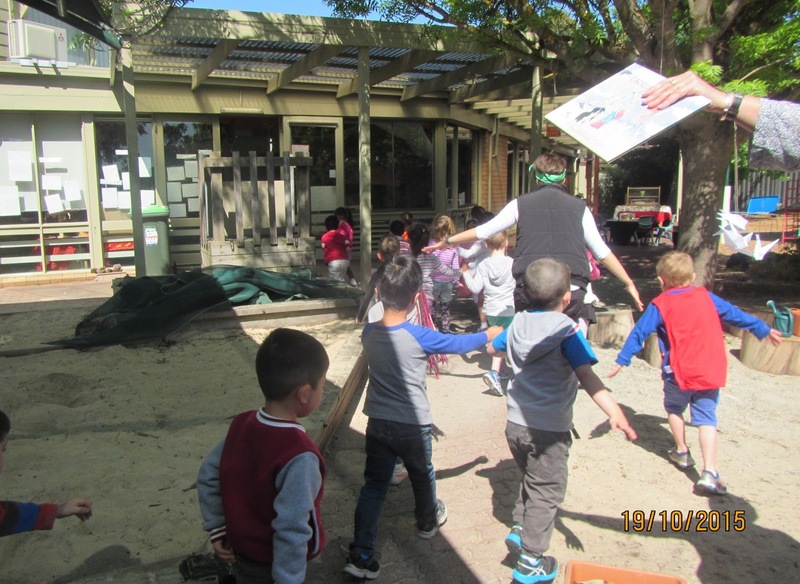 The most recent activity on the island was ship building and there was a lot of it, during both wars and then commercially. No ships are built there any more but buildings and some hardware remains, as do the houses that were once home to various supervisors. One of these is a gallery, but most of the others can be hired out for weekends and holidays. There are tents too, and the view from the tents is almost enough to make me a camper. I felt a little like I was on Easter Island with these giant relics of ship-building machinery. Short cut through the hill. Loved these gates, one with horizontal bars, the other with mainly vertical bars. Hmm. Hang on – what’s that fraying on the left hand side brick work? The ‘brick’ wall is hessian, plaster and paint. 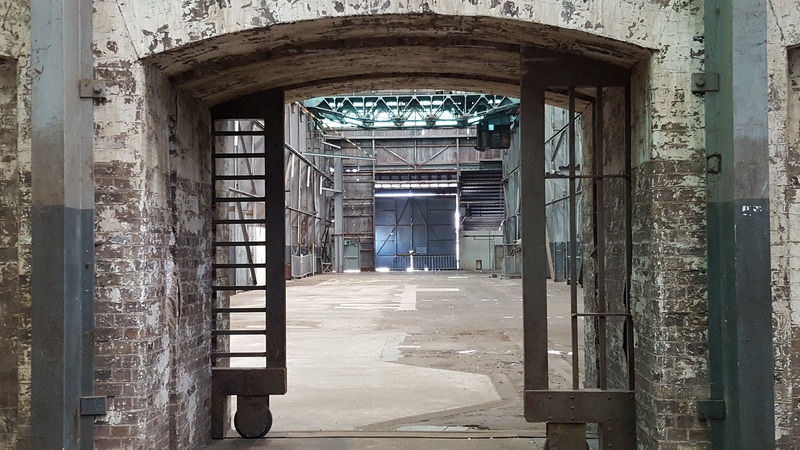 The doors, though sliding in their original tracks, were fake too, part of a film set. 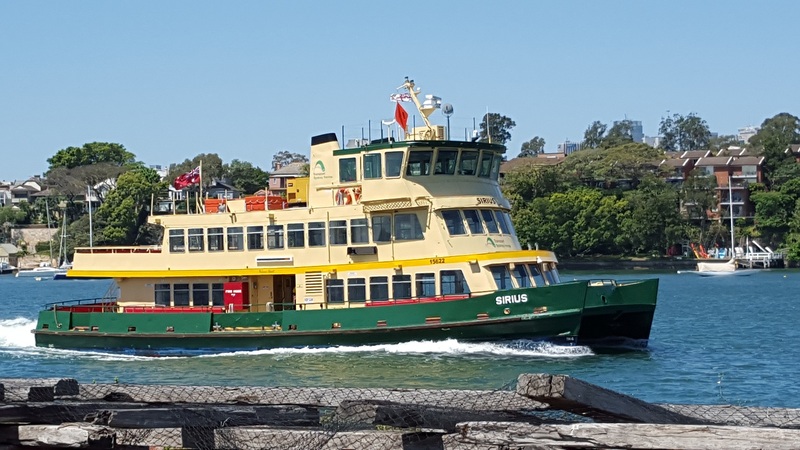 This ferry is named for the lead ship in the First Fleet. During our stay we also saw several others named for other First Fleet ships. 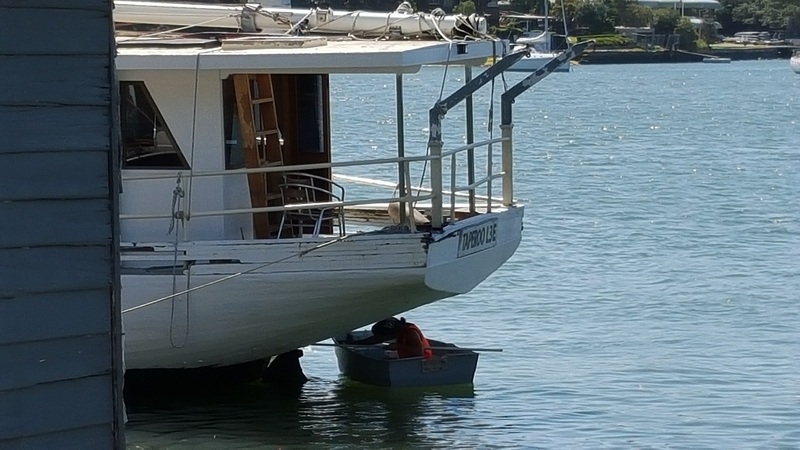 If you have to paint the underside of the boat, you might as well choose a day when it’s warm and sunny and you can do it while bobbing gently in the dinghy. ‘Emu’ won a Whitley Award! Very exciting. 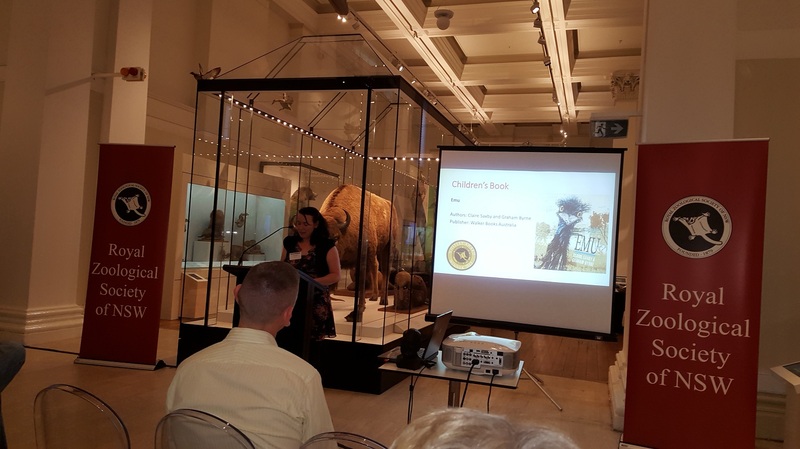 The presentation ceremony took place inside the Australia Museum, and was watched over by a bison. Of course. Graham (Byrne) wore a fish tshirt in honour of the Awards. Whitley was an ichthyologist. 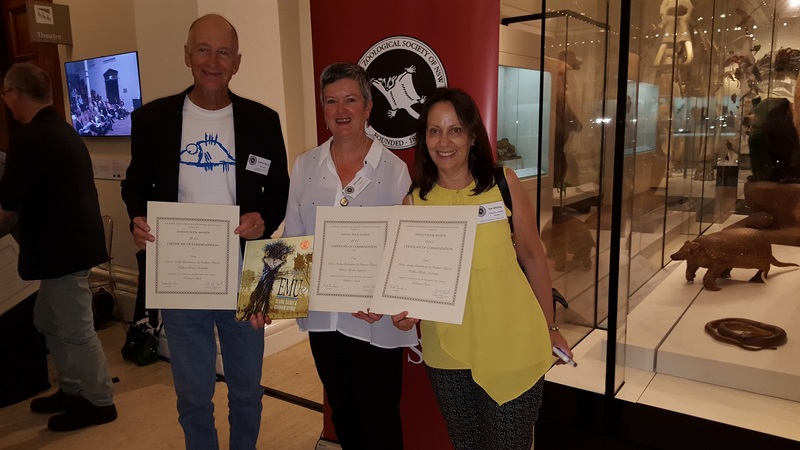 Sue Whiting was on hand to take Walker’s copy of our certificate. 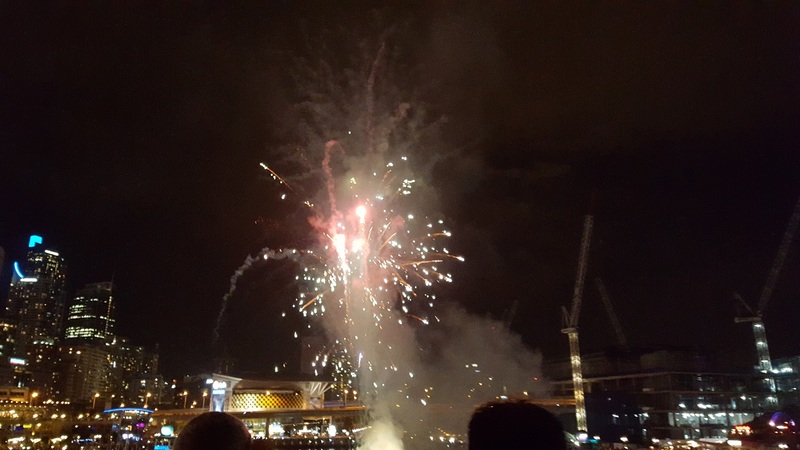 And there were fireworks! Not connected to the Awards ceremony, but delightful all the same. Apparently they are a regular Saturday night feature in Darling Harbour. 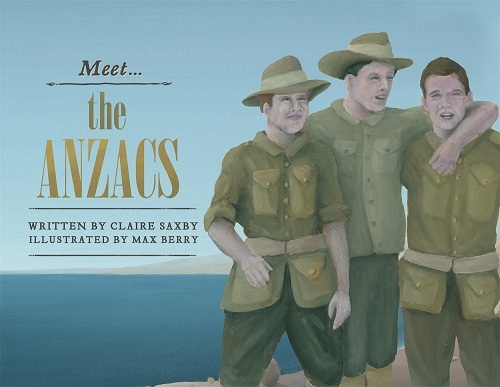 Nice to see ‘Meet the Anzacs’ on face out display at the Museum of Sydney. 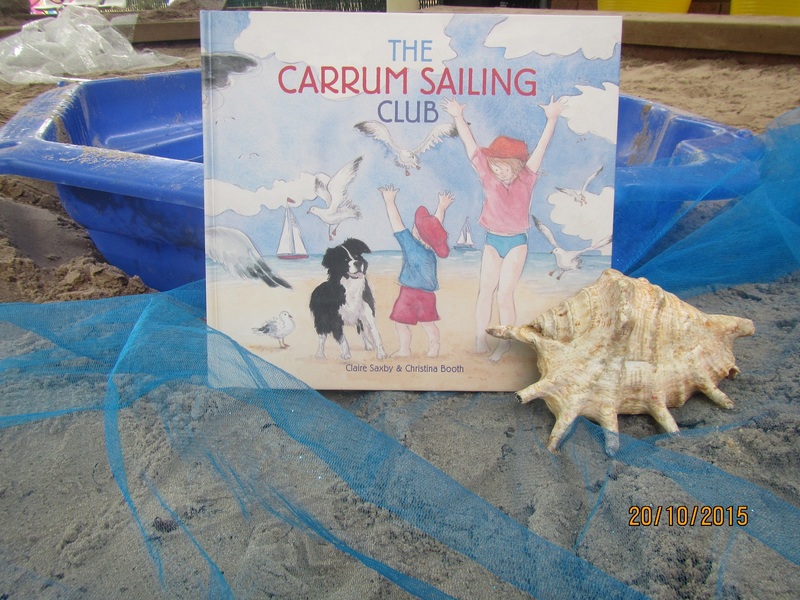 This morning I was at Keilor Downs kindergarten, reading ‘Carrum Sailing Club’ and leading the children on an outdoor adventure created by my clever daughter-in-law. Go Rach! There will be photos.